Some Trump Heads were looking for a place to eat authentic Mexican cuisine while they still can (The Wall being imminent) and ended up at Cancun Inn Restaurant in Sugar Loaf, NY. According to them, they were asked to leave shortly after putting in an order for some sangria. Discrimination! To the tens of thousands of customers who have supported us over 25 years of business in the Hudson Valley area, we have never, and will never discriminate against anyone based on race, religion, gender, sexual preference or political beliefs. There was an unfortunate situation that was brought to my attention yesterday where claims of discrimination were made by patrons of the restaurant. An employee of ours asked the patrons to leave because they were being rude to the staff and rowdy due to intoxication. I’m personally looking into the facts based on what our staff witnessed and what’s been posted here on Facebook. I would like to speak with the customers involved so please call the restaurant so I can get your side of the story. My cell phone was also listed in a post so you can call me on either number. We will also be speaking with the local newspapers as they’ve expressed interest in the situation. For their part, the Trump lovers say they absolutely were kicked out for their political views and no other reason. Though they don’t say they weren’t drinking. 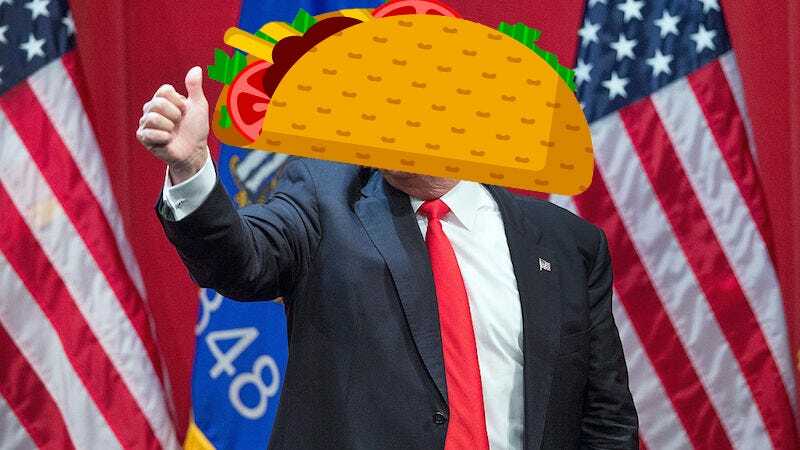 Image via Getty, Taco Head via Shutterstock.